Others have been attracted by the idea of Slow and taken the idea much further than me. Last year saw the publication of ‘The Slow Professor’ by Maggie Berg and Barbara Seeber. 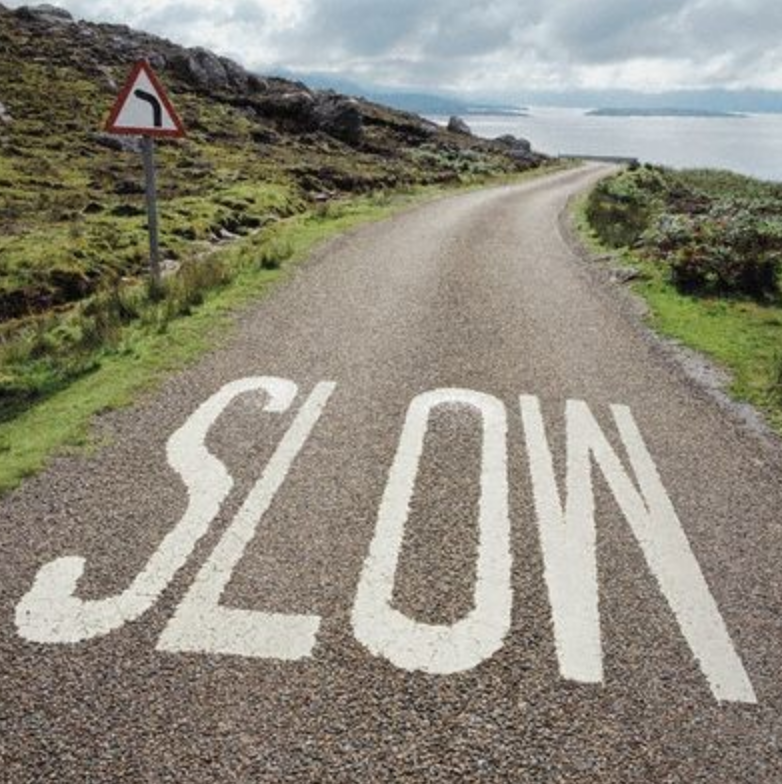 I read it with interest, but didn’t get around to writing a review before Dr Alison Edwards suggestested this post, which was a lovely extended mediation on the idea of Slow. Alison Edwards (PhD Cantab) is based in Amsterdam, where she works as a writer, translator, editor and independent scholar. Her latest research focuses on English in continental Europe and its role in local identity construction. She is the author of English in the Netherlands: Functions, Forms and Attitudes (John Benjamins 2016). She also blogs at www.theroguelinguist.com. Follow her on Facebook or Twitter. During my PhD at Cambridge, I developed the nervous habit of tying knots in my hair. Sitting in the library, I’d twist clumps of it around and around my fingers into a tight, fist-sized tangle. The procedure was very satisfying – until the knot wouldn’t undo and I’d have to cut it out. At the hairdresser’s, I’d say I’d gone to a fancy-dress party with a beehive up-do and couldn’t brush it out; that felt less freakish than admitting to wilful self-mutilation. I wasn’t worried, though, as all my friends had their thing. One developed such a violent eye twitch she was sent for brain scans in case it was a tumour. The real problem was stress. Day in, day out, you had to excel. Write another paper, go to yet another conference, run this workshop, follow that training, say yes to every opportunity that comes your way. You were constantly asking yourself: am I good enough? Am I doing enough? Worse, you were (or felt as though you were) surrounded by people whose first-year thesis work led to meetings with Bill Gates and Barack Obama. And these were the people you’d be competing with for academic jobs – mere mortals were never going to get a look in. One of the perks of Cambridge life is that ‘bedders’ came into your room every day to empty your bin, but rumour had it the real aim was to check you hadn’t killed yourself. The pressures of academic life are by no means exclusive to top-notch institutions, nor to the PhD experience. Far from it. And so, almost inevitably, people have begun calling for a “Slow Academia”. Something akin to its cousins in the Slow Movement, like Slow Food or Slow Travel or Slow Parenting. But recently, critics have come out of the woodwork. Slow academia represents privilege, they say: it’s for those who can afford it, who have already reached the scholarly summit, and it comes at a cost to those below them on the academic food chain. Slow Academia is a response to the university as anxiety machine. To a creeping, aggressive brand of academic capitalism, characterised by rampant managerialism and an insidious audit culture. Proponents of Slow Scholarship, Slow Science and the Slow University believe resisting Neoliberal U means embracing the ethics of slow. Letting ideas ripen and brewing papers gradually, rather than submitting them half-baked. Striving for quality, not quantity. Connecting with students and spending time on well-crafted, inspiring lectures. Taking care of ourselves and others. Making time to think, digest, reflect (“Bear with us, while we think”, write the authors of the Slow Science Manifesto). The key is, according to the authors of The Slow Professor, to “remind ourselves of why we went into teaching, and what it is we love about scholarship”. I have never seen such a grotesque example of tenured faculty privilege […] Poor darlings […] Let’s hope we don’t see the “Slow Nurse”, or “Slow Doctor” movements picking up amongst the professions. Why should academia bathe in this self-indulgence? At issue is that not everyone has the luxury of taking 17 years to write a book. Not everyone can labour over the composition of “slogs” (slow blogs) and “sleets” (slow tweets). Moreover, some see avoiding social media (“We are scientists. We don’t blog. We don’t twitter. We take our time”) as an abdication of role of public intellectual. Not everyone can afford to resist by publishing in places that don’t count when it comes to metrics. Not everyone feels they can risk treating research targets as a pirate code (“more what you’d call guidelines than actual rules”). As Liz Morrish points out, “the slow, careful writer who wishes to do scrupulous and yes, pleasurable work” faces being subjected to “capability procedures”. And of course, not everyone can afford to work as a part time or self-funded academic (as – full disclosure – I do). those already at the summit of the academic career structure [… ] enjoy a security being systematically denied to ever greater swathes of their younger colleagues. […] “slow professorship” only makes sense when such decelerating professors can take it for granted that junior associates will accelerate to pick up the slack. Slow academia is becoming a conservative movement – harking back to a ‘golden age’ of higher education that never was. The past privileged space of academia was premised on the exclusion of others […] Spending time in the ethereal domains of the Slow university, requires the unpaid and unacknowledged material labour of others, be they cooking and cleaning for us, caring for our children, or otherwise servicing our needs. We need to interrogate slow, by asking: Who can go slow? And, what difference does it make which university you’re at, which contract you’re on and what other responsibilities you have? We could go further still and say that slow risks acquiring the stink of self-righteousness. Not everyone is equally well equipped to fight the culture of fear. Not everyone has the wherewithal to stand up to managerial bullying. Simply surviving rather than politicking shouldn’t become a badge of shame. It is privilege in the manner of all slow movements. Take Slow Food: “something to be carefully prepared, with fresh ingredients, local when possible, and enjoyed leisurely over conversation around a table with friends and family.” This is privilege itself, but that doesn’t make it any less desirable for many of us. And at the end of the day, isn’t academia already privilege, even for those at the bottom of the university food chain? For starters, the luxury of being a knowledge worker at all means you were born in a time and place where you could get an education. Nobody becomes even an adjunct without the right degree, probably several of them. I grew up not certain university was on the cards, however desperately I wanted it. To this day I thank my lucky stars I was born in a country (Australia) that made it possible through student loans. After undergrad I worked for several years before I could pay for a master (part time, alongside work). Then it took a few more years of working two jobs and saving, working and saving, to afford the PhD. I was lucky to get a scholarship that covered my fees, and continued working throughout; always on the sly because Cambridge doesn’t condone dividing one’s precious attention (unless of course it’s by teaching for them). But however hard the slog, however many sleepless nights and anxious days, however many nervous knots I managed to tie my hair, I’m aware that even the chance to pursue that path was a privilege. The coal mine was my grandfather’s only option. I get to read and think and discuss and write, however hurriedly at times. Yes, Slow Academia is a privilege. But so is all academia. Thanks for this thoughtful piece Alison – what do you think? Are you embracing your privilege and ‘Slow’, or do you think about academia differently? Love to hear your thoughts in the comments! « Are the robots coming for our (research) jobs? Excellent piece. I don’t understand the privilege argument, both a slow (humane) working environment and slow (healthy) food may be privileges, but they should be rights. And rights are not given, they are fought for. I fully support the slow academic movement, and free organic food for everyone – I am getting more and more angry about capitalism, neoliberalism, and injustice these days…just wish they didn’t feel so inevitable. I wonder if “priviledge” is being bandied about from those who could also have competed but who chose not to? Like the author, I was never sure of going to Uni, but I put myself through, and then put myself through the staggering cost of a Master’s degree… and a generous Australian government for my in-progress PhD. I know I am lucky to be teaching – and I love it – but I had done the work and research to be able to seize a tiny opportunity when it came up, and segue it into a role that fits me well. Definitely for slow, and against this ” creeping, aggressive brand of academic capitalism, characterised by rampant managerialism and an insidious audit culture” widespread nowadays. Otherwise, an excellent piece, congratulations! Such a brilliant contribution. With all the pressure on academics today, I find the notion of the slow academic to be strangely calming and certainly thought-provoking. Thank you for this excellent post that reflects a multitude of dilemmas faced by contemporary academics! While I like the idea of slow academia and I think it’s a healthier option than the current model, I still am uncomfortable with it because it reeks of privilege. By ‘privilege’, I’m meaning the people who can actually afford the indulgence to take the ‘slow’ path are a small portion of the university workforce. To say everything in academia is a ‘privilege’ is to handwave some of the fundamental issues that, IMO, still plague academia. For instance, I know that my chances of any semblance of a career in academia are minimal, despite having publications, conference talks and being active in my field. I doubt I’ll even get an adjunct position anywhere. Why? Essentially, I’m the wrong colour, the wrong gender and I have a disability to boot. The people who get opportunities to teach at my faculty fit your pale male mould [I’ve tried and been ignored over and over]. If you tell me to go ‘slow’, you might as well tell me to scuttle the rest of my academic aspirations and I might as well leave my PhD. The ‘slow’ model only works after racism and ableism in academia are lessened. That’s more of a priority than listening to a few elite members of academia argue about wanting to slow down their work rate. I’m a PhD student coming up to the 8th year of part-time slog. I’ve had no help from the government or employers, though I’ve been successful in getting three small scholarships along the way. I worked (for myself) for the first 5 years and am now self-funded by gaining early access to my tiny super fund…There’s not much left in that, though, so it’s an incentive to finally get this thing done and dusted! But I dread the thought that what must (?) come next is the academic treadmill, teaching in particular. It’s refreshing to see someone actually making a go of freelance academic work. The funding will continue to be a problem, of course, given I have the minuscule super fund instead of a high-earning husband, but I look forward to accepting the challenge. I hope you don’t mind being adopted as my role model, Alison? Haha Liz, happy to be your role model! Good luck, stay strong! And the academic treadmill doesn’t necessarily *have* to come next, depending on what other skills you have to pay the bills!? I’ve talked about slow university before as an alternative to the more-is-better quantity over quality attitude that I see too much of. E.g. gathering lots of potentially poor quality data we don’t need/ can’t analyse, in order to write papers that don’t tell us much, vs. taking time to design and implement good research, leading to interesting findings and papers we’re proud of. We could take time, not through privilege, but by reducing the amount of dross in the system. I couldn’t agree more. Associating the “slow” movement with the question of privilege made me somewhat uneasy. To me it is not just a question of working at a comfortable pace, but really a question of quality, whether in research or teaching. But apart from sacrificing quality, i feel that the current system is also asking us to sacrifice our health and our families, and that also has its limits. It certainly does not encourage diversity. Isn’t it better to raise those issues, or should we just all accept it because we feel privileged already? Besides, what world have those critics been living in? Nurses and doctors often protest and fight for better working conditions! And that’s not to defend a privilege but a quality of service. Could not agree more! I am a midwife and fight every time I am at work for the chance to provide what could be called “slow midwifery”. One to one time to listen, understand, problem-solve, educate, hand hold and assist. This is true medical work, and some days there is not time for it. Then all that is done is taking obs and providing meds. Important work as well, but the bare minimum, and not of any lasting quality to the parents I am supposed to support. Having said that I do see my current role as PhD candidate as a priveledge. One that I am conscious of. So I try to take my time and produce quality. After all, I am here to learn as well as to produce. And learning cannot be rushed too much lest we only skim the surface and miss the deep stuff where all the mind expansion really is. This seems on-target to me! When I joined my PhD lab, I inherited a huge and valuable dataset focusing on a rare disease. It only took me only 3 weeks to find (1) an indexing error in my predecessor’s code that negated his entire thesis, (2) rampant typos in data entry, including in the patient consent boxes (!!! ), and (3) that the experimental plan had neglected to record the instrument settings under which the data had been collected, which greatly limited how the data could be processed. I similarly see my labmates rush right into simulations without first understanding the theory, publishing papers that they know are redundant, and being pressured to collect data without first knowing how it will be analyzed. I think it’s wisdom, not privilege, to encourage researchers to take a step back and make sure that their work is thoughtful and valuable. On the topic of Quality, Zen and the Art of Motorcycle Maintenance, by Robert Pirsig, has perhaps had the greatest influence on my thesis writing. His whole Metaphysics of Quality really struck a chord with me. Everything I’ve written during and after reading it is, to me at least, of far greater quality than what I’d written before. I’d love to hear from anyone else that has read it and how it has affected their writing. I’ve always meant to read that book… I remember my parents reading it and loving it. I’ll get on to it – the question of quality is close to my heart. Just a friendly annoying reminder, how’s that Zen blog post(s) coming along?